"A beautiful heirloom ingrained with family memory has become a totem of a life Saffee would rather forget—a childhood disrupted by her mother’s mental illness. 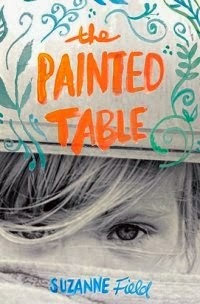 Traversing four generations over the course of a century, The Painted Table is an epic portrait of inherited memory, proclivity, and guilt. It is a sprawling narrative affirmation that a family artifact—like a family member—can bear the marks of one’s entire past . . . as well as intimations of one's redemption." Wow, where to start? This book is not one of warmth and laughter. Instead, it is the story of those who struggle with mental illness and the affects that it has on all those around them. So many will relate and not only that, will be drawn in. You'll cry alongside Saffee and move with them from house to house. At the end, you'll breathe a soft sigh as you close the final pages because Saffee has become a real part of your life. Even though this might not be one of those light hearted, fun reads, I can't suggest enough that you find yourself a copy and read it. It may give you insight, it may give you a new way of thinking or maybe, just maybe, it might even move you. I received a copy of this book through Litfuse. All thoughts, comments and opinions are 100% mine.